If you've found this page, chances are that you or someone you love is dealing with hammertoes. If that’s the case, you already know about the physical pain and emotional toll that hammertoes can cause. You also know how hammertoes can force otherwise active and vibrant people onto the sidelines of their own lives. What you may not know, however, is how a new surgical option is changing how we correct hammertoes so that you can get back on your feet and back in your life. 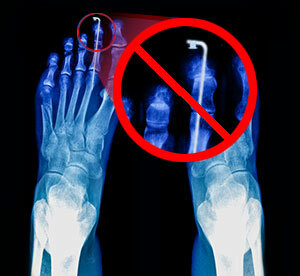 Traditionally, hammertoe surgery often used a solution called k-wires. These wires were inserted into the problem toe to achieve realignment. However, since very few patients get excited by the idea of wires literally sticking out of their toes, we developed the HAT-TRICK◊ Lesser Toe Repair System to surgically realign your toes, lessen your pain, and give you back your active lifestyle without the use of wires. Recurring Toe and Foot Problem? Is your fashion sense putting your best foot forward? Tight or narrow toe boxes, and very high heels in your stylish shoes can cause toe pain and problems such as hammertoe and claw toe. Don't let toe pain cramp your style. We've got the answers you need. Learn more about your toe’s anatomy, the conditions you may have, and the treatment options available to you. The HAT-TRICK MTP Joint Repair system uses special instruments and techniques to reattach ligaments and bones in their proper alignment without removing bone, avoiding permanent bone modification and unnecessary ligament and joint cutting. Learn more about the HAT-TRICK MTP Joint Repair system, your MTP Joint, and your surgical options. Certain marks Reg. US Pat. & TM Office. All Trademarks acknowledged.